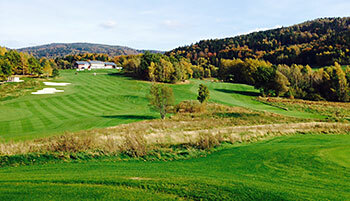 There are seven courses in close proximity to the north Bohemian city of Liberec, three of which (Liberec, Malevil and Ypsilon) are 18-hole layouts. It’s hard to believe that up until the end of the 1980s, fewer than that number of courses existed in the whole of the Czech Republic! Ypsilon was designed by Austrian-based architect Keith Preston (whose Albatross course near Prague opened in the summer of 2009) and Ypsilon became an instant hit with local golfers when it opened for play, voted course of the year by readers of Golf Digest’s Czech edition in 2006 and 2007. Holes have been expertly routed in two returning nines over a hilly landscape, with plenty of elevation changes to ensure a round here is no easy walk in the park. Nevertheless, bunkers are generally shallow and fairways open so a game of golf at Ypsilon is far from arduous. The signature hole is regarded as the 220-yard par three 13th, where the tee shot is played to a green perched on the other side of a small valley. The advice here is not to underclub, “otherwise you will find yourself watching the ball land on the opposite slope and wondering why it was so short”. None could wish for a better inland setting for a golf course than at Ypsilon. A huge area, with no houses, roads or electric power lines in sight, just rolling hills, thousands of oak trees and beautiful views over green hills and, as a backdrop, the Luzice Mountains. At one stage I suggested to the owner that he call the course Thousand Oaks Golf Course but he decided on the more international understandable name which also fits the geographical location. What the golfers don't see is the solid granite rock just a few feet below the rolling fairways, although it does come to the surface at times, providing an extra visual stimulus. Because of the rock we decided to reduce earth movement to a minimum, winding the holes around and over the hills instead of blasting them away. The ecologists were pleased and the golfers seem to appreciate it too. One of the Top 3 courses in the Czech Republic. Hilly parkland course with stunning vistas on surrounding mountains. It is challenging both physically and strategically, and the weather could be changing here rapidly. There are some short drivable par 4s (7th and 12th) as well as very difficult and long par 3s, in particular when played into prevailing wind (4th and 13th). The true test of your golfing skills is the par 5 15th hole, combination of both strategic and risk/reward design. Enjoy the great view form the back tees on the 17th hole. Ypsilon was host to multiple professional tour events, including European Challenge Tour. The course is usually in top conditions, with some heavy penalizing rough (and/or bio-zones, as it is located on SSSI) and moderate fast greens. Clearly my top course in the Czech Republic. This course was absolutely perfect! I played it at the end of April and the greens were in better condition than many greens in Spain or Portugal. Each hole is interesting, the views are stunning, for me it's a top course in this part of Europe and one of the 10 top courses on the continent.